Describes how to set up an Debian 8.5 (Jesse) operating system on a Toshiba Satellite U505-S2960 notebook computer. 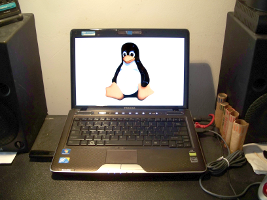 This page describes how to install 32-bit Debian 8.5 (Jesse) Linux operating system on a Toshiba U505-S2960 notebook computer. Details of issues from previous versions are on my Ubuntu 9.10 installation guide or Ubuntu 10.4 installation guide or Ubuntu 12.4 installation guide. Wireless Interface Terminal Commands: The wireless network can be started with the command ifup wlan0 and stopped with ifdown wlan0. Don't forget to turn on the wireless switch on the front edge of the machine (next to the antenna graphic). RF-Kill: One oddity that appeared with the 3.0 kernels is that the front panel wireless switch can no longer be switched on after booting. If the switch is off when you boot, you will have to turn it on and reboot to get wireless, although it can switch the interface off and on if it was on during boot. I did try removing the rfkill tool (sudo apt-get remove rfkill), although I'm not sure whether that was what enabled switching off. I prefer to see what's going on with my machine rather than have the boot messages hidden behind the splash bitmap just in case there's a boot problem (which used to happen alot). startx: After these changes, on boot you will see the system startup messages and then be greeted with a console login prompt. After logging in, you can use the startx command to start the graphical desktop. AppArmor: is a security policy utility of some kind. It seems to not be used for much anymore. Bluetooth support is enabled by default. I don't ever use bluetooth. Gwibber: is a microblogging client so you can smoke crack without having to light up. Zeitgeist is another big-brother event logger. Speech Dispatcher is a speech synthesis service that is enabled by default. Thankfully, I do not need this.